Once upon a time, children, in the long, long ago, there was an inspired inventor called Duncan Cameron. In those days of horseless carriages and ridiculous hats, people wrote with either a goose feather or a pointy steel dip nib. The feather was OK but the nib had a tendency to dig into the paper, sending a spray of ink, together with the occasional blot across your penmanship. Duncan addressed this problem by creating the Waverley nib, characterised by a narrow waist and and an upturned nib. Some say the nib was patented in 1850 and others say it was 1864. Either way, ’twas ages ago and I don’t have the energy to hunt down the truth of the matter (bad, bad historian; slaphand). Anyways, it was an immense success and the nib was taken up by almost everyone except schools where they liked to continue to torture the children with paper-slasher nibs. Probably independently, Sheaffer took up the idea of tilting the tips of nibs, particularly their tubular nibs, in the belief that this made them smoother writers. They were wrong, of course. Those tip-tilted Sheaffers don’t write any more smoothly – or indeed any different – than any competently-made nib. Mr. Richard Binder took up the idea of the Waverley nib some time back, though for some reason he transferred the idea to fountain pen nibs, rather than dip nibs where it actually has some benefit. Now, I see in FPN, he has acquired the commercial rights to the term and is getting a little snappy about others using it. Considering how much the term has been bandied about in the last few years, it seems unlikely that it could be legally limited in this way. It’s amusing, though, how these things come around. When Duncan Cameron named his improved nib after Sir Walter Scott’s novels and the area of Edinburgh where the main railway station is, he couldn’t have foreseen that the concept would give rise to litigious grumblings on the other side of the Atlantic a century and a half later. However, as we know, the history of the fountain pen is one of homages and copies. Truly, there’s nothing new under the sun! Oh, well spotted! I hadn’t seen that one. Yep, that too. Quite a literary lot, Macniven & Cameron! Love that pen Deb. Don’t suppose that you might consider selling it to me? Sorry to say those were archive photos, Rard. That pen was sold about three years ago. stunning stunning pen…. Oh my… yes..that nib is fabulous. Is it fine? Flexy? Not flexy? I haven’t had that pen for some time, so I don’t remember offhand whether it was fine or medium. It was hard as a nail, though, in the best Duofold tradition which the pen was obviously copying. I’ve had Macniven & Cameron leaf-shaped nibs that were flexible though, and they were a delight. I have been looking at Macniven & Cameron for a while with increasing desire to get one. I had even looked at the eBay eyedroppers, though that concept was not especially a selling point for me. I made an offer and luckily it was turned down, as a couple of days later I stumbled on what has turned out on arrival to be, as described, a nearly mint glossy BCHR lever filler called Waverley No.94, with a flexible spade nib. I am feeling very lucky and have e-mailed my thanks. Better deal than the eBay one too. That sounds like an excellent pen. I’ve had several of the leaf-shaped nib Macniven and Camerons over the years, and when they are flexible they’re just about the best nib you can get. I am looking for a Macniven and Cameron which writes well. 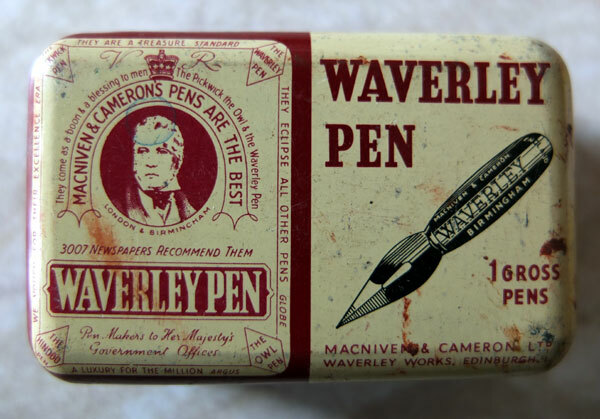 I obtained one of those Waverley eye droppers from ebay. Clearly it has never been used. I inked it and tried to write. I suppose it will be a while before it gives me some pleasure in writing. It is getting better though. What is your pen doing? I’ve had those eyedroppers and they usually write well out of the box. It may need a little adjustment. Many thanks for replying to me. I agree with you that the pen may need a little adjustment for better ink flows. The nib also scratches a little. I have to apply a little more pressure to get ink flows sometimes. It does have some flex. However as my experience with flexible nibs is rather limited, I am afraid I may damage it. At present it is writing no where as smoothly as the wonderful Swans I got from you recently. I was reading the repair section of your blog to see if you have recommended any repairers. You did mention some excellent repairer who repairs your pens. But there was no name. I wonder if you could recommend someone please. I will be grateful. I plan to learn to repair my own pens in future and get the tools ( I have perused your great advice on tools and reair). But that plan is in cold storage at present due to lack of time. I can recommend Eric Wilson (http://eckiethump.webs.com/). He does great work and he’ll have your M & C writing as it should. 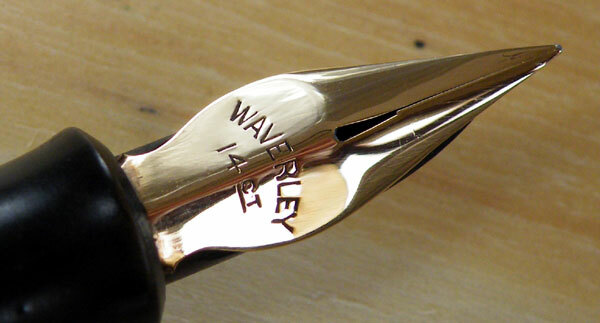 The article includes photographs of one of my Waverley nibs and an original Waverley dip nib. And for what it’s worth, which I do realize isn’t very much in today’s litigious society, I do have the approval of Waverley Cameron, who is Duncan’s great-grandson and a quite delightful person besides, for my use of the name. My husband, as someone old enough to have suffered being made to write with sharp-pointed dip nibs left me in so doubt about the wonderful improvement that the Waverley dip nib is. I have a tin of them here and I’ve given them a try and I concur; they are the best of the general-use dip nibs by a mile. I didn’t go into a paean of praise of them in this article because that wasn’t its point. The point was, rather, that transferring the tilted tip to fountain pens seemed unnecessary because fountain pens have tipping material and less of a tendency to dig into the paper than sharp dip nibs. It seemed to me that the tilting of the tip made no difference to how the pen wrote, something I proved to myself with Sheaffer nibs, some tilted, others not, which seemed to me to write the same. Someone has since pointed out to me that many people coming from the ballpoint write with the pen at something close to a right angle to the paper, and that the upward bend in Sheaffer nibs and others like your own compensates for this to a degree and gives them a smoother writing experience, particularly noticeable with fine nibs. I’m sure that’s right and it is one response to people’s apparent inability to come to terms with different technology. Production started in 1864, with the patent issued in 1865. Interesting thing is that there are other, earlier patents for upswept tips. As for terminology, there is also a long history of turnup nibs being called just that (or “pens with turned up points” and the like). They have never been called “Waverleys” as a generic term. A wonderfully clear explanation, David. I think you’ve gone a long way to clarify these much-muddied waters.